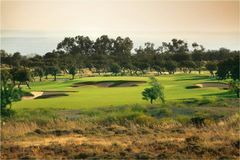 One of the most important new European golf courses of recent years, The Elea Golf Club near Paphos, Cyprus, was designed by six-time Major winner Sir Nick Faldo. The magnificent par-71 golf course at Elea Golf Club commands a striking location above the shimmering Mediterranean Sea and has been meticulously crafted through dramatic landscape, featuring imposing weathered outcrops of limestone that offer a unique character across the course. Commenting on his vision for Elea Golf Club, the designer, Sir Nick Faldo, said: "This golf course certainly has the potential to play a pivotal role in establishing this part of the world as a leading European golf destination. "When we designed the golf course at Elea Golf Club we decided to put the emphasis on thoughtful, rather than big-hitting, golf and there are plenty of strategic riddles for the golfer to explore and unravel over all 18 holes." The fascinating layout circulates through stands of mature carob and olive trees, while the dramatic outcrops of weathered limestone strike a contrast with the deep green of the seaside paspalum grass fairways and semi-roughs. In a carefully planned ecological design, individual holes are fringed by undisturbed and un-irrigated swathes of colourful native ‘garrigue' flora. This stunning visual effect invokes a truly Mediterranean feel, while retaining the ethos of a traditional and dramatic experience for the golfer. In addition, the wildlife of partridges, birds of prey, butterflies and lizards thrive on the benefits of this carefully protected environment. One other significant feature of Elea Golf Club is the large and sumptuous clubhouse that also boasts underground parking facilities. Great course, great condition. Greens like Augusta. (Tricky) but well worth playing twice. Beautiful course, great facilities. Nice restaurant and good food. Golf slow but not too bad. Nice and helpful staff. Great views. fairways and greens good - if unreadable?! surrounds still being worked on. As holiday golf should be.